Earlier in the week I wrote about the incredible cultural and food experience that is the suburb of Footscray, including everything from dumplings and cannoli to sugarcane juice and an Ethiopian feast. This is part two of the market series, featuring Box Hill Central, east of Melbourne CBD, which is an area home to a large Asian population. Consequently, the food is killer good. 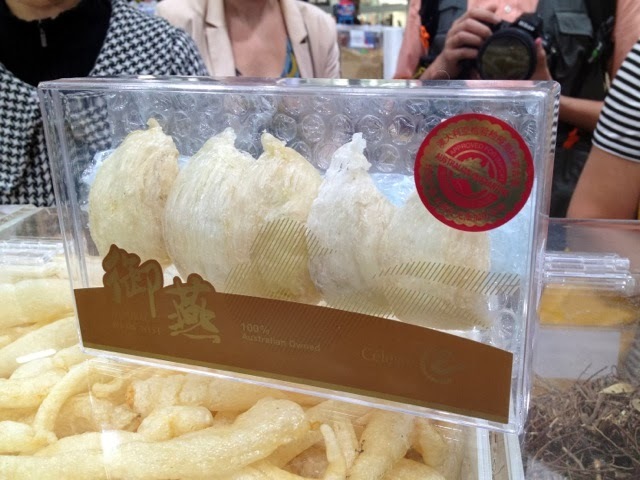 Again, this tour was put on to publicise Melbourne Food and Wine Festival 2014, specifically the Asian Seafood Graze Festival. Our group of 10 media professionals and bloggers were treated to a cooked lunch by James Tan, whose name you may have heard in association with Camberwell’s Magic City, and The Mandarin Duck at Crown. Since then he’s had stints in Singapore and Sri Lanka. If you want to check out what we ate, see my Instagram feed @fi_bird. I’m not going to mention the dishes here because they’re unavailable to the public, but I will post the recipe for the summery spanner crab and coconut salad starter soon. 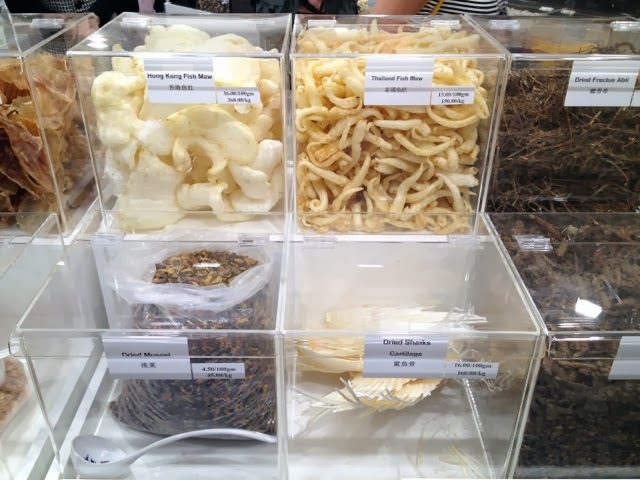 This post is dedicated to our inside look of the market at Box Hill Central, including tips on both cooking and Chinese medicinal benefits, as well as all the exotic ingredients I discovered. Dominic Yu, a Hong Kong migrant who moved to Australia in the early ‘70s and has worked in the hospitality industry for 25 years, led our tour. I was especially taken by his knowledge of Chinese medicine, and how it relates to eating. For example, he refuses to take tablets for his bad knees, instead eating boiled chicken’s feet every night to strengthen his bones. Apparently it works. 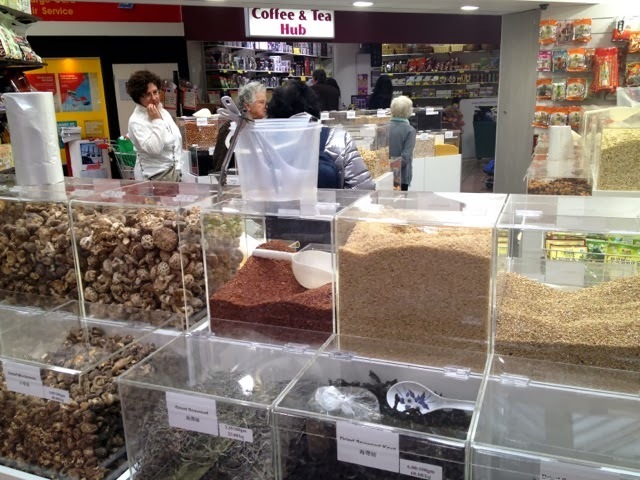 Box Hill Central was the first markets Dominic visited when he came to Australia. Originally opening in 1895 and becoming a shopping centre in 1987, it remains his favourite shopping destination in Melbourne. You’ll find your usual grocers, delicatessens, butchers and fishmongers, but the product on offer is different. There’s also a herbalist and many specialty stores you’re unlikely to find in more westernised suburbs. Our tour started, perhaps irrelevantly, with a butcher called Meat Inn that specialises in unremarkable Italian sausages. Children ran up and whipped away skewered samples in both hands, so if nothing else, they’re a hit with the kids. More interesting were the tubs of blood jelly, often cooked with congee; and the pig’s trotters, which Dominic said new mothers boil with vinegar and drink the tonic to restore their bodies after birth. Central Meats was next, a butcher specialising in Aussie-grown Sher Wagyu beef from Ballan (near Ballarat). According to Dominic, it’s so good they export it back to Japan and offer an air-tight sealing service for customers who want to take it back overseas. 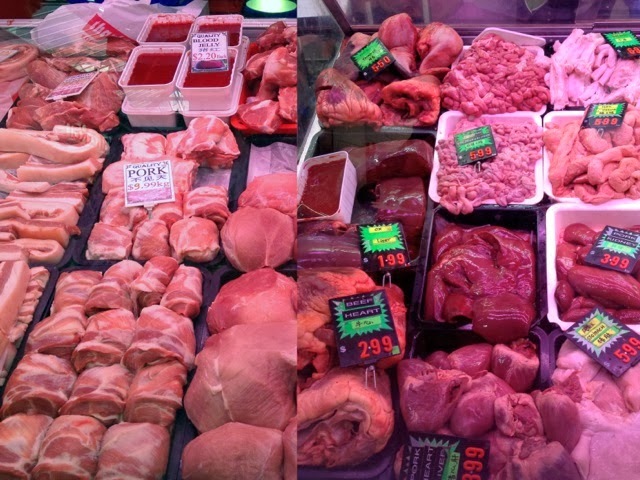 The range of offal on offer was also impressive. Next it was time for a chicken run at Yarra Range Poultry. It wasn’t the chicken that caught my attention but the availability of pigeon, salted duck eggs, century eggs and crocodile meat, which Dominic says was trendy in the ‘90s because it’s so lean. “Tastes like pork,” added the lady behind the counter. 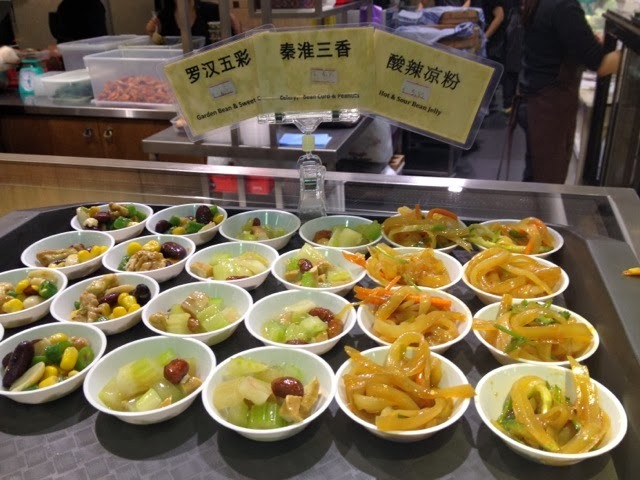 Asthmatics can boil crocodile meat with lean pork and drink the broth to lessen symptoms, while those with a sore throat should eat congee with salted pork. Silkie chicken, a breed with black skin and soft, fluffy feathers (they’re ridiculous looking birds), was available around the corner at Top Chicken, and when boiled with goji berries, can better your eyesight. Here you’ll also find Chinese delicacies of duck head (served marinated and cold with wine as an entrée) and duck tongue. 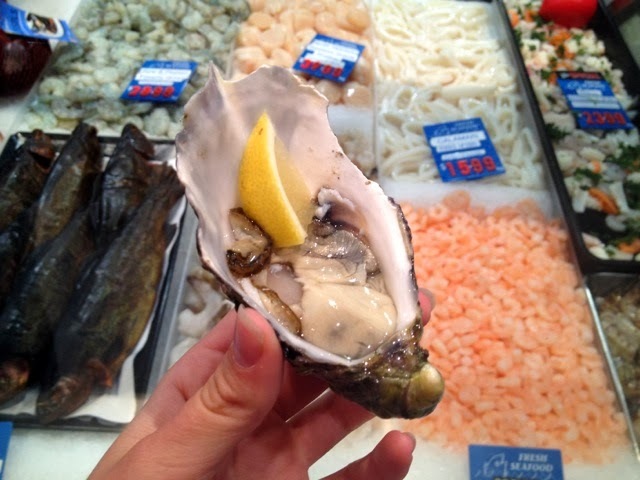 By now it was well and truly time for morning tea: fat, juicy oysters from Box Hill Fish Market. The rest of the group politely refused seconds, but by the time I was onto my fourth they followed my lead. Waste not; want not. 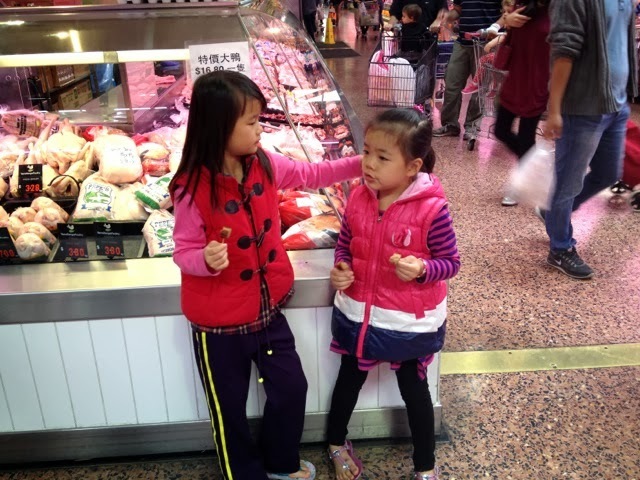 Here Dominic explained the Chinese tendency to always buy scallops with the roe still attached as a marker of quality. We also stopped by Lord Barramundi Seafood, which specialises in frozen steamboat ingredients, fish heads for traditional fish head soup, and even sea cucumber, which you cook by charring on a flame, peeling off the charcoal skin, and then boiling until tender. The Chinese often serve it with seafood, such as prawns and scallop. Our next stop, funnily enough, was run by an Italian fellow called John. 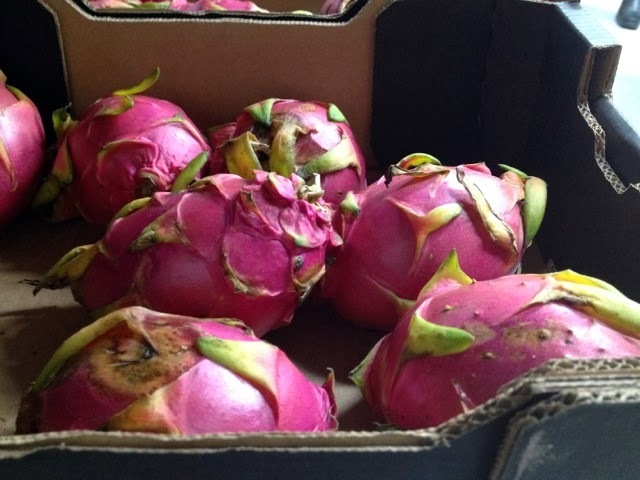 John guarantees quality “or your money back” at Box Hill Fruit Market, and although we sampled huge melons, nashi pears and vibrantly coloured dragon fruit, I found it all rather bland and extraordinarily expensive compared to Victoria Market. Perhaps it’s best to stick to Chinese-run stores in Box Hill. Tan Hung Asian Grocery was next on the agenda, an emporium of fresh and dried Asian produce such as mushrooms and noodles. Dominic handed around a plate of chilli beef jerky, aptly noting it’s addictive qualities, “It’s like cocaine!” Magic Cuisine, a corner store in the centre, was the highlight for me. They hand-make steamed buns and do a roaring trade of obscure takeaway goods, such as chilli pig’s ear, duck neck, chicken gizzards, mushroom and gluten, ox tongue and tripe, pickled vegetables and sliced tofu so long and thin it could be noodles. It’s a fabulous place for the adventurous and dirt cheap, too. Around the corner you’ll find Food Master, where Dominic’s father apparently built a reputation for himself by regularly buying ginseng for its Viagra-like properties. 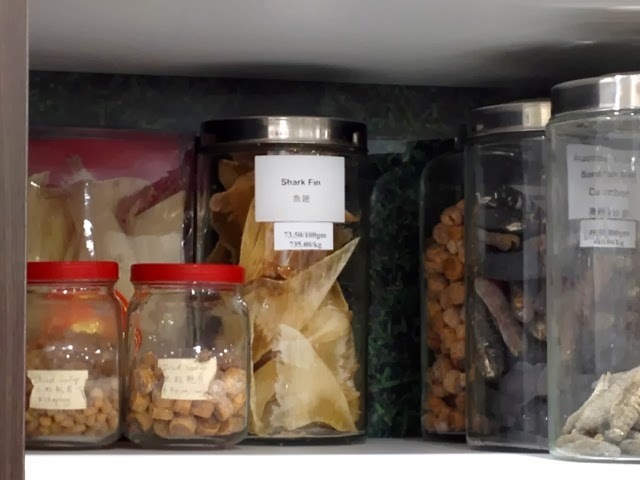 Plastic boxes with plastic scoops are loaded with beans, dried fish, mushrooms, herbs, flowers, roots, herbs, crocodile skin and other fascinating ingredients. Also available over the counter is the sought-after bird’s nest, made from the saliva of swallows. Dominic guaranteed me they’re better than botox; although five will set you back $140. And, if you put the opportunity of new experiences before your moral standing, you can also buy a kilo of shark fin for $735. It’s probably best to finish on a sweet note, specifically Sweet Kingdom, a store specialising in Asian candy, biscuits and packaged ice cream. Fans of red bean, sesame and matcha will have a field day. 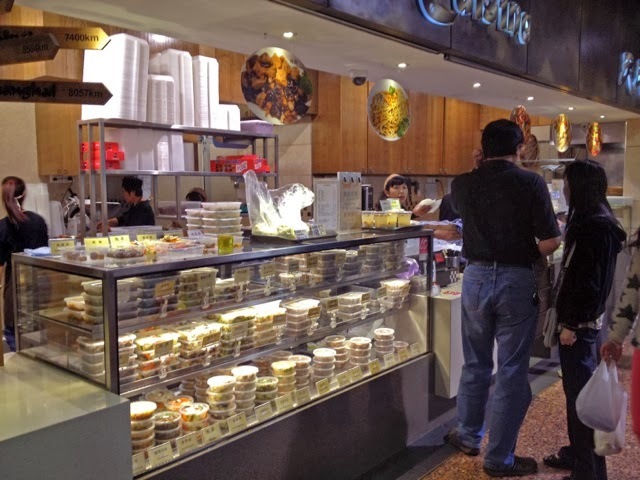 With such variety and everything Asian families could need to make Melbourne feel even more like home, it’s hardly surprising people from as far out as Sunshine regularly shop at Box Hill Central. While Melbourne Food and Wine Festival 2014 is a great opportunity to check it out, you’ll find as much colour and excitement walking around and stopping for snacks here every day of the week. I know I'll be back to test my stomach at Magic Cuisine in the near future. 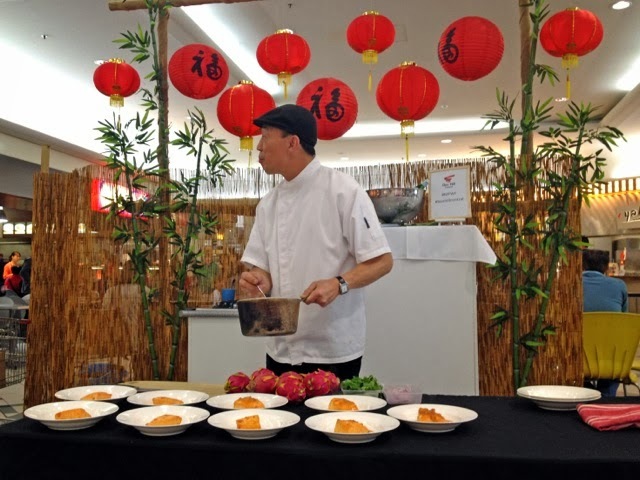 On March 2, Chef James Tan and chefs from nearby Food Republik will teach shoppers the art of dumpling and noodle making with a demonstration (samples and recipes included) at 11am and 1pm. February 28 to March 3 will also see a series of $10 seafood dishes from Box Hill Central’s retailers. Is that bird nest really $140? That's a very good price! !